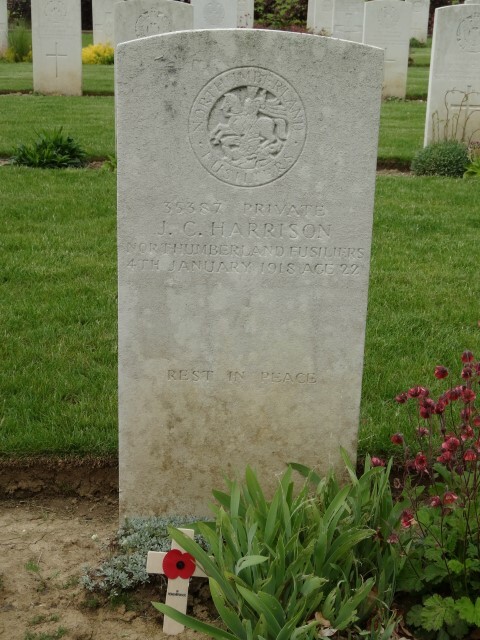 35387 Private John Chapman Harrison, 12/13th battalion, the Northumberland Fusiliers was killed in action 4 January 1918 and is buried at Heudicourt Communal Cemetery Extension, France. He was 22 years old and is commemorated on the Etherley War Memorial and the Roll of Honour in St. Cuthbert’s Church, Etherley. By 1901, the family lived at Etherley where Robert was employed as a colliery carpenter/joiner. By 1911, Robert was a widower and his daughter 23 year old Margaret was the housekeeper. Robert worked as a colliery joiner and 15 year old John worked as a joiner for a builder. By 1922, Robert Harrison lived at Street House, High Etherley. John Chapman Harrison enlisted at Bishop Auckland into the Durham Light Infantry being given the regimental number 3529. Later, he was transferred to the 12/13th Northumberland Fusiliers. 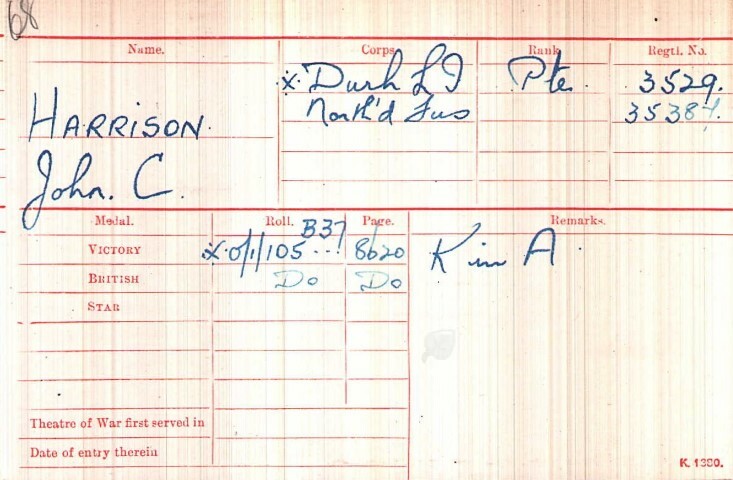 Private J.C. Harrison did not enter France until after 31 December 1915. Private J.C. Harrison’s service record has not been researched therefore it is not possible to record with any certainty where he served. He was killed in action 4 January 1918 along with 20087 Corporal Ralph Hall. There was no major battle taking place at this time therefore it is likely that they were victims of the usual violence of warfare – hit by shell fire, machine gun fire or sniping. Private J.C Harrison was awarded the British War and Victory medals.